← ALLAN N. HALL. The problems of dual citizenship. WANNING SUN. Megaphone diplomacy is good for selling papers, but harmful for Australia-China relations. The issue of China’s influence in Australia is complex. It ranges from worries about national security, political donations and media infiltration to concerns about scientific collaborations, Confucius Institutes, the patriotism of Chinese students, and allegiance of the Chinese community. The most recent trope is China’s so-called “debt trap” diplomacy with Australia’s neighbours in the Pacific. But there’s a simple reason this anxiety about China’s influence is so vexed. For the first time in history, Australia has had to deal with a world power that is not, as longtime defence analyst Hugh White puts it, “Anglo-Saxon”, and is not a liberal democracy. To quote The Australian’s Dennis Richardson in relation to China and the US: “Australia is friends with both, ally of one”. The media in both countries have played a significant role in inflaming tensions, as well. Increasingly, China is cast in an adversarial light in the Australian media, and vice versa with Australia in the Chinese media. There is less and less space for journalists who try to put forth an objective opinion and for commentators who attempt to steer the debate in a more rational and less visceral direction. Each side feels the need to simplify its message and take an increasingly radical position. Of course, the media narratives in both countries need to be considered in the context of the rise of political populism globally — particularly the triumph of President Donald Trump in the US and Brexit in the UK. Australia has a free but financially struggling media. This makes for a tricky combination. Take a media sector that is desperate to boost its readership, combine with a populist turn in the political discourse, add a generous dash of fear of China’s growing global power, and stir. The result, while great for sound bites and political posturing, is not a pretty picture, but it does make a good story. Some commentators argue the public debate about Chinese influence in Australia tends to be dominated by hawkish voices who favour close ties with the US. This strident position runs counter to the diplomatic, business and university communities, who argue for a more culturally sensitive and constructive engagement with China. To the anti-China hawks, concerns for Australia’s multicultural harmony and social cohesion are secondary. Meanwhile, China’s extensive soft power ambitions to improve the country’s appeal on the international stage also seem to have been moved to the backburner when it comes to Australia. The charm offensive is no more; it’s now just plain offensive. Populism also reigns supreme in China, although in different ways. The tighter and wider the scope of the Communist Party’s political control, the less space there is for dissenting voices, and the more fertile the ground becomes for nationalistic discourses to flourish. In fact, in an increasingly repressive environment of control and censorship, nationalism is the only populist game in town if you want to make a profit. Australia poses a problem for China. If we mind its silly carryings-on, it will deplete our energy, and it doesn’t seem worth our while; however, if we leave it be and pretend nothing is happening, that would only encourage it, and it may go from bad to worse. Australia is one of the countries that have benefited most from China’s rise, yet it is also one of the most provocative voices in the Western bloc. It is beginning to look like a piece of chewing gum stuck to the bottom of China’s shoe. The Global Times is a subsidiary newspaper of the Chinese government’s mouthpiece People’s Daily, but unlike People’s Daily, it is profit-driven and licensed to drive sales by pandering to populist sentiments rather than to reason. The question is whether the Australian media should take the bait, trade insults with The Global Times, and allow such visceral responses to shape the debate. There are signs the Australian media are not only taking the Global Times seriously but also literally. In fact, so literally that if you enter the current China debate in Australia and critique some aspect of the anti-China rhetoric — and then get quoted favourably (and possibly out of context) by The Global Times — you may automatically qualify for being labelled a Beijing apologist. Can this kind of sustained war of words have an actual impact on how the two countries view one another? Yes, it can. One only need look at the recent rhetoric of top government officials in both countries as an example. 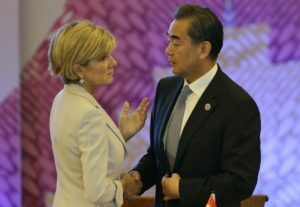 Last year, Prime Minister Malcolm Turnbull vowed to “stand up” to China in an unusually sharp statement, while Foreign Minister Julie Bishop made a blunt assessment of China’s lack of democracy. China’s Foreign Minister, Wang Yi, just last week told Bishop that Australia needs to remove its “tinted glasses”. Anecdotally, I’ve been told by some of my Chinese-Australian friends that their friends and families in China are repeatedly urging them to “stay safe” and “take care of themselves” as Australia becomes more anti-Chinese. But are Australia-China relations really as bad as the media have been making them out? If you look at the current number of Chinese tourists and students here, maybe the answer is no, or at least not yet. But the business community has already started to suffer. As recently as two years ago, both countries were hoping to use their respective media to promote public diplomacy towards each other. At the moment, media organisations in neither country are doing that. In fact, public diplomacy has well and truly been replaced by megaphone diplomacy, specialising in what The Guardian’s Katherine Murphy calls“binary and cartoonish talk and analysis”, as is often found in the “graphic novel” genre. The question we should be asking is not whether the relationship between Australia and China is as bad as the media in both countries portray it. Rather, it’s how much power the media has in shaping this relationship, and whose interests this current megaphone diplomacy is serving. This article was first published by The Conversation on the 29th of March 2018. Wanning Sun is a Professor of Chinese Media and Cultural Studies at the University of Technology Sydney.